Tiana Johnson and Jeffery Moffitt are pressed for time. Rehearsals begin momentarily for The Island of Lost Souls, the 2016 culminating performance for students of Big Thought’s Creative Solutions summer program at Southern Methodist University. So Johnson and Moffitt, the artistic force behind this year’s stage musical, have just a few minutes to chat. Their passion, however, is timeless. This is Johnson’s second year as choreographer, a role perfectly suited for a talented actress and dancer who recently completed a month-plus run as an ensemble cast member of Dallas Theater Center’s production of Dreamgirls. SMU is home turf for this recent graduate who completed her Master of Fine Arts in theatre this past spring. Moffitt’s Creative Solutions history dates to 2009 when as an SMU freshman he served as assistant scene designer. He was scene designer from 2010-2013 and became artistic director in 2015. Moffitt earned his Bachelor of Fine Arts in theatre during spring 2013. He also has a Bachelor of Arts in English. Together they drive the always-anticipated Creative Solutions culminating performance, the crowning achievement that caps seven weeks of work with teen students on probation after being convicted of a crime. Since 1994 Creative Solutions has been giving second chances to teen probates by teaching them life skills through performing and visual arts. 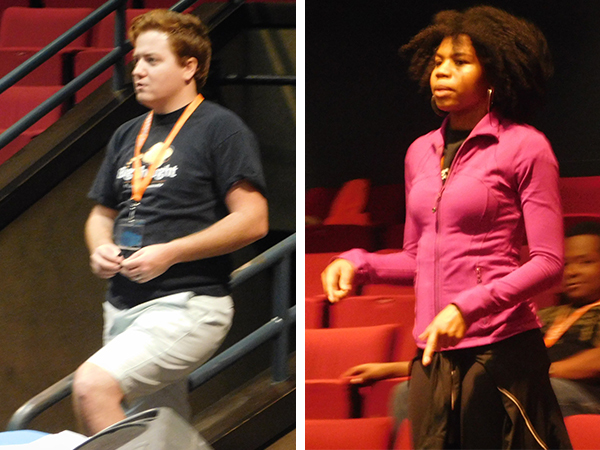 The students are doing just that during The Island of Lost Souls, the Creative Solutions original musical that premieres Thursday, July 28, at 1 pm at the Greer Garson Theatre inside SMU’s Owen Arts Center, which is part of the Meadows School of the Arts. Subsequent Island performances are at 7 pm July 28 and 1 pm July 29. The Island of Lost Souls tells the story of three kids who journey into an unknown adventure to rescue their friend Freddy who has disappeared into the mysterious “island.” But when it comes time for all the kids to return to the “land of the living,” Freddy must make his choice: Stay on the island or return to earth and face his problems. The new musical serves as a companion piece for last year’s Club Generation, which dealt with the topical subject of police overuse of lethal force. The Island of Lost Souls takes that issue into bigger picture territory and presents a story the addresses the divide between kids and adults fueled by stereotypes. Adults don’t believe kids solely because they see them in a certain light, because they can’t identify with them. It’s all about validation. The idea that I exist and you can’t silence me just because you have some preconceived notion of me. 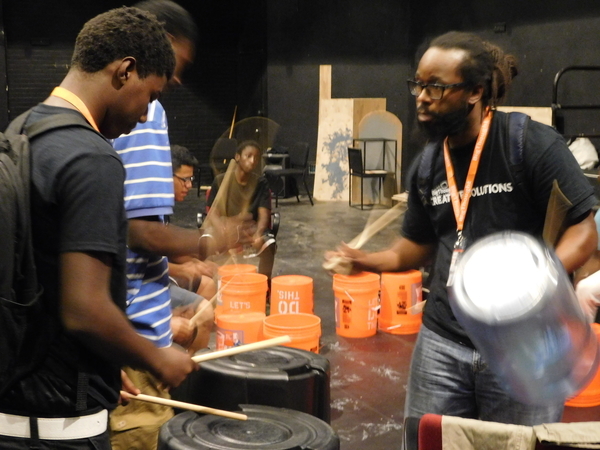 Validation is paramount for Creative Solutions, and Johnson sees it regularly while working with the students. “It’s important even before the culminating performance,” says Johnson, the former Miss South Dallas who is part of Dallas Theater Center’s resident acting company for 2016-2017. There is a complete transformation during those seven weeks, a transformation that manifests itself in that culminating performance. The students are fortified by artistic skills (music, acting, drumming, dancing, writing, singing), life skills, job skills, story sessions, brainstorming ideas, open expression, script work, choreographing, and stage blocking. Johnson, who received rave reviews for her performance in DTC’s The Mountaintop last year, sees the very unvarnished side of that metamorphosis. For Moffitt and Johnson, watching dreams materialize in disenfranchised students that never thought they’d have the voice to make their innermost wishes come through, much less the wherewithal, is an immensely rewarding experience. Johnson sees a little bit of herself in these students. She sees the passionate desire to be creative. She sees their raw need to live the dream. Big Thought’s Creative Solutions thanks the Dallas County Juvenile Department, Dallas County Juror’s Fund, Southern Methodist University Meadows School of the Arts, Anonymous, ExxonMobil, Mr. and Mrs. David Chortek, Ms. Serena Simmons Connelly, Mr. Tom Connelly, Elizabeth Toon Charities, Hillcrest Foundation, Sammons Enterprises, Inc., The M.R. & Evelyn Hudson Foundation, Mr. Jay Judas, Texas Bar Foundation, The Junior League of Dallas, Katherine C. Carmody Charitable Trust, Ms. Eliza Solender, TurningPoint Foundation, Texas Commission on the Arts, National Endowment for the Arts, and The Ellen Wood Fund for their generous support. Kayla Gilchrist walked a path that led her to Big Thought’s Creative Solutions. But at first, she had no idea this is where she was headed. The 21-year-old from Keller, Texas, a soon-to-be-senior at Prairie View A&M University, is an ExxonMobil Community Summer Jobs Program Intern with Creative Solutions, a respected program that teaches performing and visual arts to juveniles convicted of a crime. Gilchrist initially wanted to intern at the South Dallas Cultural Center, but there were no openings. Harold Steward, manager of South Dallas Cultural Center, led her to the ExxonMobil Community Summer Jobs Program website. It was there that she found Big Thought’s Creative Solutions. Gilchrist, majoring in mass communications with a minor in theater arts, felt Creative Solutions was a perfect fit, since her passion is theater, particularly acting with some singing and dancing. She has performed in middle school, high school, college, and community theater productions. 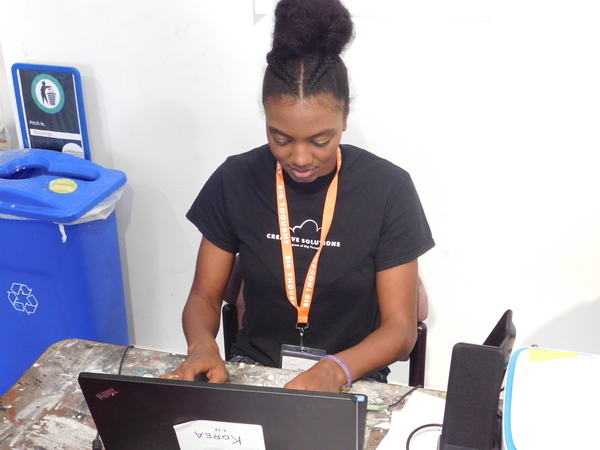 Her job centers on Creative Solutions’ Summer Program at Southern Methodist University Meadows School of the Arts. Gilchrist is part of the CS administrative staff. 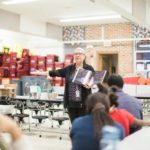 She supervises files for 60-80 students, takes attendance, puts together paperwork for Big Thought contractors including the Dallas County Juvenile Department, participates in sessions, and mentors students in performing arts. Yet perhaps most importantly, Gilchrist lends a sympathetic ear for kids who need to talk. She gives them support. Gilchrist took a break from her Creative Solutions duties at SMU to talk about a job experience she says she will never forget. How do you feel during those sessions with the kids? What does art mean to you, especially in relation to Creative Solutions? How crucial is the Creative Solutions safe haven for these kids? How did you find your own talent? 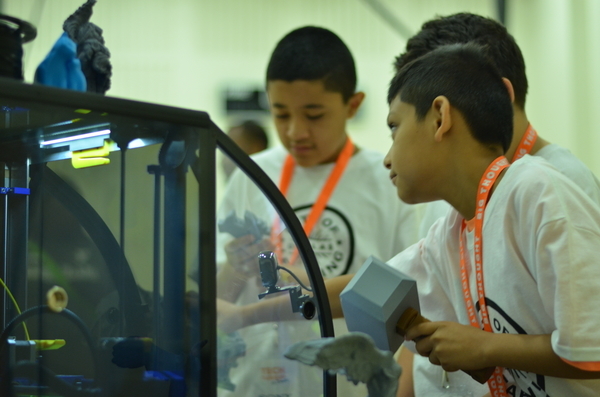 Do you feel like you were meant to work with these kids, to be part of Creative Solutions? Big Thought thanks the following donors for their generous support of Creative Solutions: Dallas County Juvenile Department, Dallas County Juror’s Fund, Anonymous, Southern Methodist University Meadows School of the Arts, ExxonMobil Foundation, Mr. and Mrs. David Chortek, Ms. Serena Simmons Connelly, Mr. Tom Connelly, Elizabeth Toon Charities, Hillcrest Foundation, The M.R. & Evelyn Hudson Foundation, Mr. Jay Judas, Texas Bar Foundation, The Junior League of Dallas, TurningPoint Foundation, Katherine C. Carmody Charitable Trust, Ms. Eliza Solender, Texas Commission on the Arts, National Endowment for the Arts, and The Ellen Wood Fund. 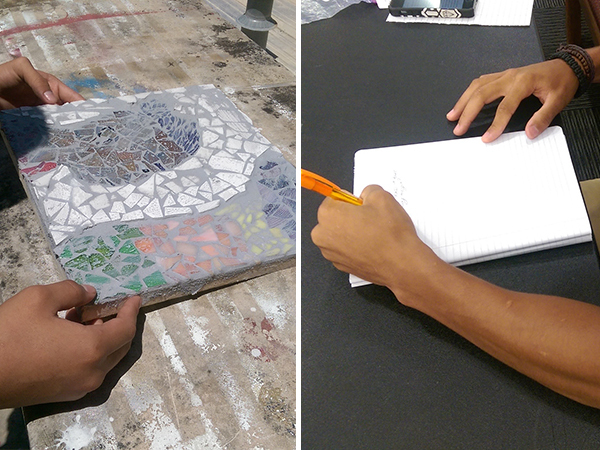 Christian and Diego are forever connected through their life-altering involvement in Big Thought’s Creative Solutions summer program at Southern Methodist University’s Meadows School of the Arts. 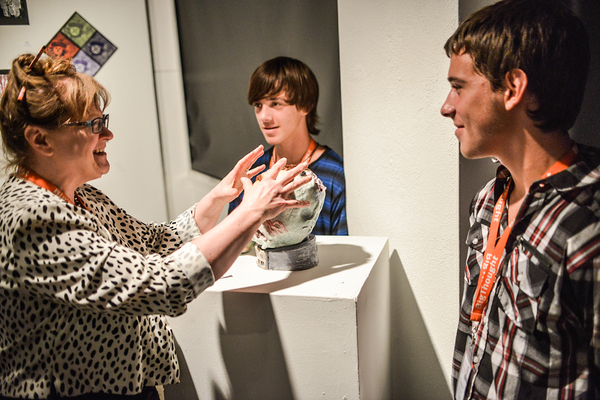 Creative Solutions teaches art to juveniles convicted of a crime, giving them a second chance at an enriching future. 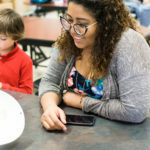 So they spend hours each day inside the Owen Arts Center – Christian exercising his muse in the performing arts theaters, and Diego creating colorful masterpieces in the visual arts workroom. Yet one is a returner and one is a newcomer. Returners started the summer 2016 program on June 14, while newcomers commenced on June 15. Both continue through the official close of this year’s program with the culminating performance July 29. Sitting down to gather thoughts from Christian and Diego underscored the many similarities shared between a teen who knows the ropes and one just learning the scene. They both need to be validated, they crave the opportunity to be expressive, and they relish the nurturing vibes of an encouraging environment. Take a look at these mini profiles, and see them at work in the photos. We need to be respectful of their identities in pictures and in text. But their personalities, their will to matter, always shine. What is the power of Creative Solutions? Does this feel like family?